ST. PETERSBURG — A new name, a research and tech hub, a riverwalk and even Pinellas County's first convention center could all one day come to the 86-acres surrounding Tropicana Field. 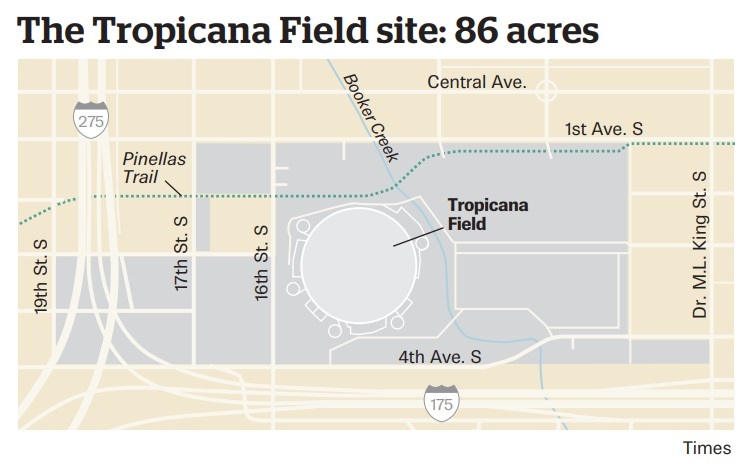 But first, city officials want everyone to stop calling it the Trop. The planners mapping out the massive redevelopment project want to move beyond the baseball dome and reconnect with the area's history. That's why the project has been dubbed — for now — as the Gas Plant District, said Randall Morton, design principal with HKS Architects. 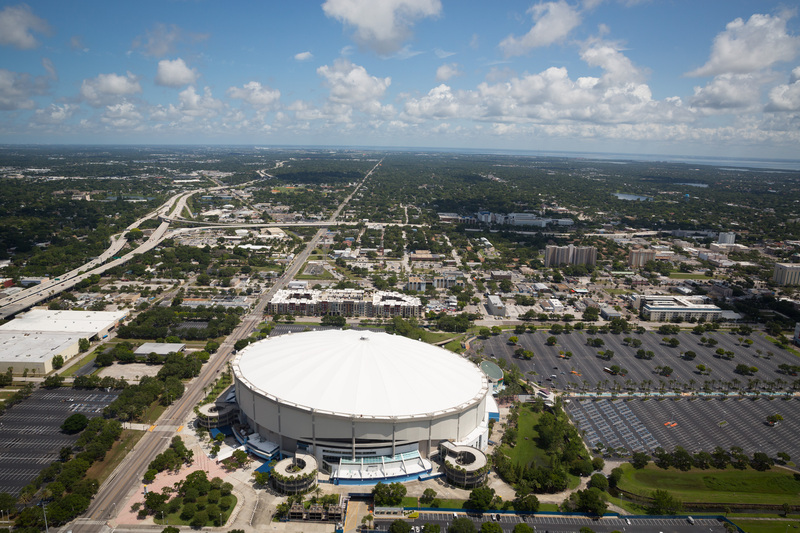 The name change harkens to the African-American neighborhood the city bulldozed decades ago to build the then-Florida Suncoast Dome, which opened in 1990. PREVIOUS COVERAGE: Tropicana Field will come down one day. What will replace it? HKS Architects, a New York firm, is drafting a master plan for the site. They've already completed one with a new baseball stadium. Now the firm is designing a plan without a home for the Tampa Bay Rays, should they move to Tampa. Many hopes and desires are tied to the future of the 86-acre site. It's been called the most important economic development opportunity St. Petersburg has seen in decades. Some view it as a salve to the city's challenges: the chance to develop affordable housing at all price points; a way to reconnect south and central St. Petersburg; an opportunity to attract high-paying jobs; and maybe even the site to build the convention center that Pinellas officials have long desired. 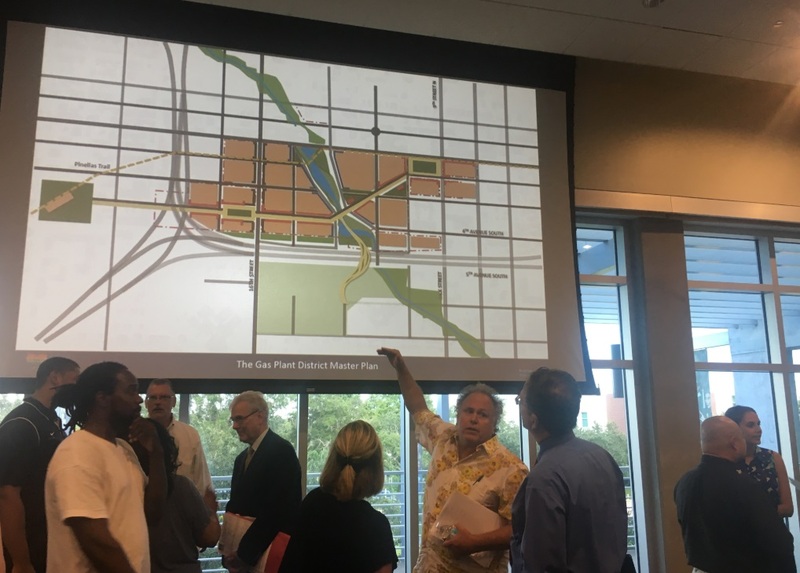 Morton and Alan DeLisle, the city's development administrator, unveiled the plan to more than 200 people Monday evening at the University of South Florida St. Petersburg's campus. They stressed that there's still time for residents to have their say before the final plan is assembled. The 45-minute presentation revealed a vision of what the valuable property west of the downtown waterfront could look like when the Trop is eventually torn down after the Rays' contract to play there expires in 2027. One big reveal was the proposed convention center. Tampa's waterfront convention center attracts all the convention business in the bay area. Pinellas County has never had such a space, though the one proposed by HKS would be much smaller. But in the Gas Light District plan, the redevelopment could see a convention center built that would be tied to a tech-oriented campus, perhaps for USFSP. Think labs and classes, but also a performance hall for lectures, art and maybe even concerts and sporting events. Planners are also setting aside space for the hotels that would be needed to serve a convention center. PREVIOUS COVERAGE: Deadline clock ticking on Rays agreement with St. Pete: What happens next? "That helps us to attract a more diverse work force," she said. "And to have housing there, too, you have the live, work, play dynamic going on in such an amazing way." Planners propose taking Booker Creek, which winds through the site, and turning it into a water feature that would be surrounded by terraces, sidewalk cafes and retail, as well as creative lighting and public art. "Booker Creek is going to become, really, one of the centerpieces of the community," Morton said. While Booker Creek could become a north-south draw for tourists and shoppers, a proposed pedestrian promenade would offer a similar corridor running east-west through the district, with retail options and a local vibe. "We have a big belief in this being a regional attraction," Morton said, referencing the estimated 1.5 million visitors who annually visit the area for Rays games. "We have to find a way to attract people here to come do other things." DeLisle and city officials are also hoping the Gas Plant District can address one of the region's most pressing needs: affordable housing. The goal is for new housing to hit on all sizes and price points, not just low-income. The plan calls for creating 3.2 million square feet of housing. That means housing would account for about half of the space not already designated for public spaces and amenities. Considerable time and discussions have been dedicated to how the new district could better connect St. Petersburg's central and southern neighborhoods, which are divided by Interstate 175, DeLisle said. Right now, I-175 splits off from I-275 and has created a concrete barrier dividing neighborhoods such as Campbell Park south of the Trop from the development around the dome. The crowd at Monday night's presentation applauded when Morton brought up leveling out the interstate and building at ground level. "The success of the Gas Plant Site is going to be directly connected to reconnecting some of these communities that have been separated," he said. Crowd reaction was so positive that DeLisle brought up the point again later, searching for more input. "In terms of the barrier discussion on 175, just by raising your hand, is that something that struck home?" he asked the crowd. "Is that something we should continue to look at?" About two-thirds of the crowd raised their hands. DeLisle said the city is "on a fast-track with this planning process" because it had already gathered plenty of public input in drafting the baseball stadium phase of the plan. The city expects to have fewer community outreach meetings during this planning round, but looks to hold meetings with smaller group over the next two months. The next master plan will be given to City Council in October.